I can’t say enough about these. 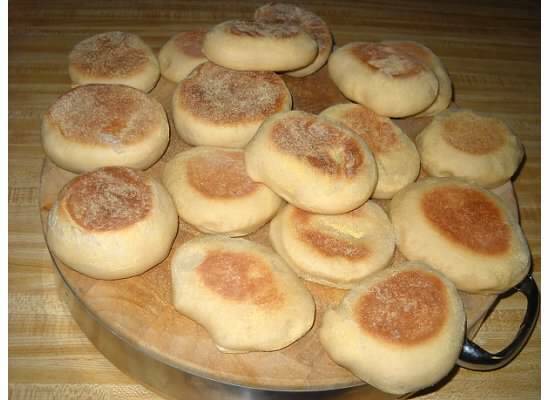 I love English Muffins and normally make my own. (OK, the last time I had them I was lazy and knew I didn’t have time to make a batch of homemade by morning so I bought a famous name brand muffin from our supermarket) After I popped them out of the toaster, I thought they were smaller than they used to be so I measured a fresh one from the package…3 inches! What? Muffins are supposed to be 3 1/2 inches! All muffin rings today are a standard 3 1/2 inches in diameter. This allows restaurants to place eggs (also 3 1/2 inches) into a muffin and make it look good. Anyway, the new muffins are smaller and more expensive. So today I took the time to make my own again…oh were they delicious too! Much better than those thin shrunken ones from the store. I realized I have never put this recipe online on my blog so today I will. I use a 3 1/2 muffin ring to cut mine out but by the time I’m done man handling them, they get a bit cockeyed. (not identical). Place milk in the bowl of your stand mixer fitted with the paddle attachment and sprinkle the yeast over top. Let sit for 10 minutes and then add the melted butter, salt, sugar, egg, and flour. Mix on low until the flour is incorporated and then switch to medium and beat for 5 minutes – dough will be very soft and slightly sticky. You should be able to form it into a ball without it sticking hard to your hands though. pull dough out and place into an oiled bowl and cover, letting rise for up to 2 hours or at minimum double the size. Place dough on a floured surface and using a rolling pin roll to a thickness of 3/8 to 1/2 of an inch. Using a muffin ring or a glass at least 3 1/2 inches in diameter cut out muffins as you would cookies. Each should weigh 2 oz. Carefully place muffins on a cookie sheet lined with parchment paper and freely covered with corn meal. Coat by spinning muffin then flip over and repeat on the other side. Use two cookie sheets if needed. Let rest for 20 minutes. I let mine rise in a warmed oven to increase the rise…NOT HOT! Carefully transfer the next batch to the griddle so as not to deflate them and cook the same way the first batch was until done. Repeat until all are cooked. Let all of them cool completely on a rack before splitting open with a fork. Muffins will keep fresh on the counter a few days in a gallon sized zip lock bag and they freeze well.